A new program launched by Jeffersonville marks a major expansion in access to higher education for its residents, as the city concentrates on strengthening its trained workforce. Jeffersonville Mayor Mike Moore in November announced the creation of the Jeffersonville’s Promise program. The program, funded by tax-increment financing, will offer full-tuition scholarships to every Jeffersonville High School graduate to go toward two-year degrees at the local Ivy Tech Community College campus. Jeffersonville will commit $150,000 in tax-increment financing funds per year to support the program for the next five years. TIF is a tool that allows local leaders to dedicate funds generated by economic growth in the community to worthwhile causes, such as education, infrastructure and more. The program represents just one way the city has used TIF funds to invest in education. The city has committed more than $400,000 of TIF dollars each year to its local school system, Greater Clark County Schools. The program is designed to offer “last-dollar scholarships,” which means students must first accept all federal aid, local aid and other scholarships. Students must meet certain academic requirements to apply. Across the state, cities and towns are forming partnerships with education providers to boost the number of residents with post-secondary degrees. In Shelbyville, Advantage Shelby County is a joint effort by the city, county and Ivy Tech to provide scholarships to cover tuition costs for up to two years. Like Jeffersonville, the program is designed to provide “last dollar” assistance for Shelby County residents, so the funds pay for tuition costs not covered by other financial aid. The scholarships are modeled off of tuition assistance programs in other states, including the Tennessee Promise. In Tennessee’s program, students can apply for aid to attend one of the state’s community or technical colleges. The program will begin with the Jeffersonville High School Class of 2019. Students must earn a minimum of a 2.0 high school GPA and maintain a 2.5 GPA at Ivy Tech. Students must complete the FAFSA. Students must enroll in credit-bearing and workforce-focused courses toward attainment of a certificate, certification or degree at Ivy Tech. 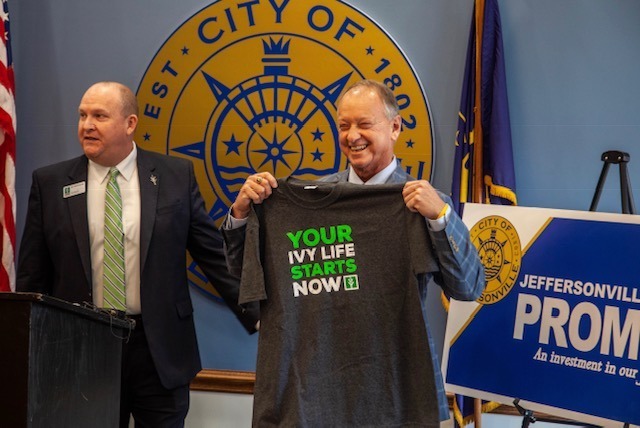 Students must enroll at Ivy Tech during the summer, fall or spring term after their high school graduation starting in Fall 2019.